Aside from the disagreeable photo-op, this was such a perfect day. Crisp, cool weather, bright blue sky, beautiful run along the Columbia. Reminded me of all the things I love about living in the Tri-Cities. I felt great on the run, only getting a little beat around mile nine–but we can’t take all the fun out of it, can we? After my last half-marathon, which I ran with an injured foot, this race felt like a dream. I even shaved 13 minutes off my previous finish time! (Yes, I had an injured foot last time, but I’m still giving myself full points for improvement.) Crossing the finish line, I felt happy and high. I came home and Megan asked me hopefully, “Mom, did you win first place?” I told her no, not quite. She said, “That’s okay” and hugged me. I think she thought I must have come in second or third, and thus was being generous with her praise. It was the best part of my already great morning. Keri was so fun to train with. It’s a special kind of friend who’ll meet you at 4:45 a.m. to run eleven miles on a Friday morning before going home and getting the kids ready for school. We would get grumpy the night before, just dreading the long run, but after waking up and getting a few miles into it, we’d remember why we make ourselves go. Nothing feels so good as the blood pumping ferociously through your veins while you run through the cool air toward the orange and pink sunrise. Very zen. My husband came to cheer me on and take this awful pic. Thanks, honey–I always appreciate your support. And thanks, Keri, for doing this with me. This was my last big hurdle before leaving for our trip, and I’m feelin’ kinda saucy. Life is good when your half-marathon is behind you and Hawaii’s straight ahead! Lora: Yes–accomplishment by association counts the same as real accomplishment! I apply this logic to looks, money, spirituality, you name it. It saves me a lot of time and stress. Esther: You do realize that you are my newest Hot Friend, right?? So since I’m not what you would call a “runner”, am I just supposed to surround myself with people who are runners? I’m doing fairly well so far. You always amaze me at what you can get done in a week. I’m in awe. The amazing thing is that you haven’t even been talking to me about this upcoming run! Not only can you do it, you can do it with ease. I forgot this was coming up for you. Way to go – you rock! That is amazing. You are my idol. I just WISH I could look that good after running 13 miles. You don’t even look like you broke a sweat! hawaii?? lucky! way to go on the 1/2 marathon! 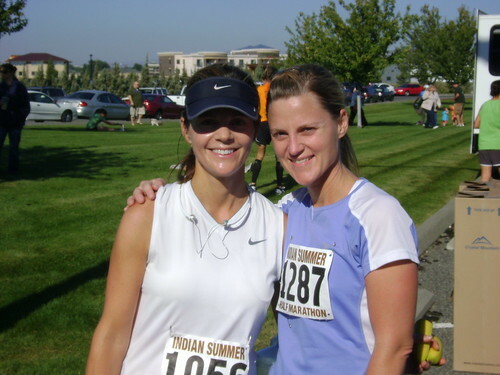 this post made me feel extremely guilty about my non-running habits as of late. A picture of myself after running (just even a mile) would look hideous. You do not look that bad. But I do agree with surrounding yourself with hot friends. I do the same. Congratulations on such a great physical feat! And have fun in Hawaii. What a great treat! Congrats Jen and you are one of my hot sister-in-laws so don’t knock your beauty! You are my idol! Trip to Hawaii? I am so jealous – you deserve it! Have fun!